WHEREAS her birth signaled the responsibility as mother to teach what it is to be Lakota therein the question: What did I know about being Lakota? Signaled panic, blood rush my embarrassment. What did I know of our language but pieces? Would I teach her to be pieces? Until a friend comforted, Don’t worry, you and your daughter will learn together. Today she stood sunlight on her shoulders lean and straight to share a song in Diné, her father’s language. To sing she motions simultaneously with her hands; I watch her be in multiple musics. WHEREAS confronts the coercive language of the United States government in its responses, treaties, and apologies to Native American peoples and tribes, and reflects that language in its officiousness and duplicity back on its perpetrators. Through a virtuosic array of short lyrics, prose poems, longer narrative sequences, resolutions, and disclaimers, Layli Long Soldier has created a brilliantly innovative text to examine histories, landscapes, her own writing, and her predicament inside national affiliations. “I am,” she writes, “a citizen of the United States and an enrolled member of the Oglala Sioux Tribe, meaning I am a citizen of the Oglala Lakota Nation—and in this dual citizenship I must work, I must eat, I must art, I must mother, I must friend, I must listen, I must observe, constantly I must live.” This strident, plaintive book introduces a major new voice in contemporary literature. 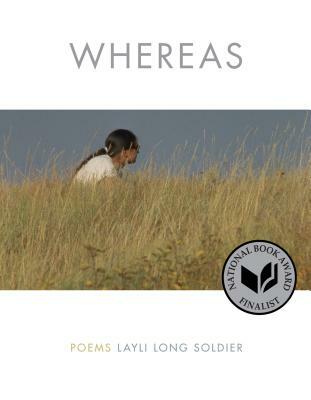 Layli Long Soldier received a 2015 Lannan Fellowship for Poetry, a 2015 National Artist Fellowship from the Native Arts and Cultures Foundation, and a 2016 Whiting Writers' Award. She lives in Arizona and teaches at Diné College.